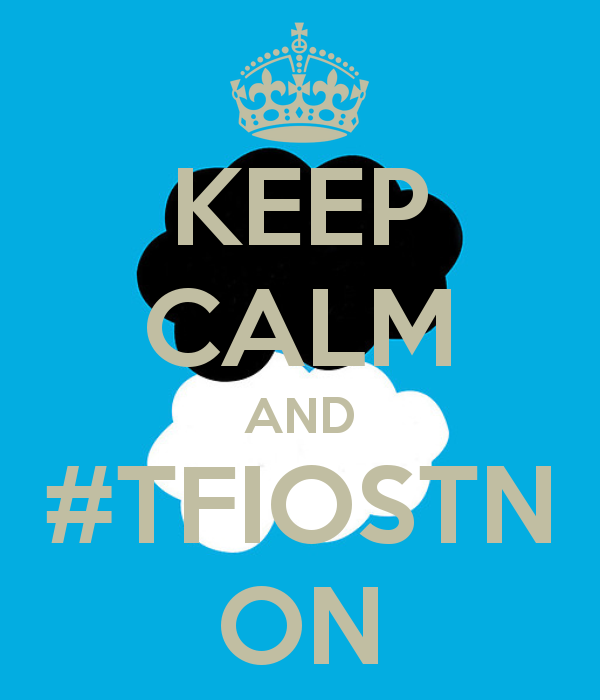 Several weeks ago a contest began on Tumblr allowing fans of the wildly popular John Green novel THE FAULT IN OUR STARS to vote for their state to get one of only four visits from the author and the stars of the movie by the same name: Shailene Woodley, Ansel Elgort and Nat Wolff. Pretty sure that was the fastest "YES" in the history of ever. Yep. I channeled my inner Katy Perry. Somebody needs a chill pill. Finally, after many hours of hard work it was time for the event. We found out early Thursday morning that people had started lining up on the steps of War Memorial Auditorium at midnight for the 7PM event. Holy cow! The midnight crew. That dude may be the best dad ever. I have never seen such a large crowd be so awesome. It was so much fun to talk to all of the people that had driven for hours, stood in line all day long and still had smiles on their faces. Nerdfighters truly are made of awesomesauce. 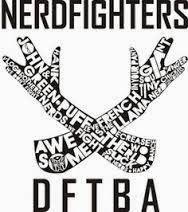 Nerdfighters. Awesomesauce. See, I told you so. 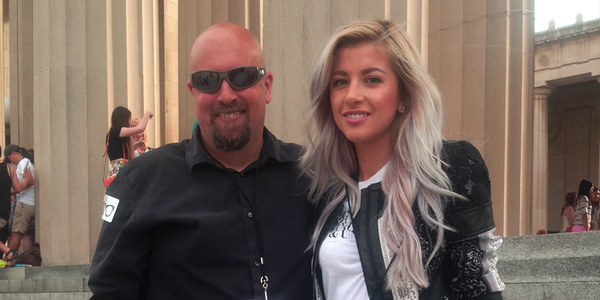 I had the privilege of hosting the event with a good friend of, and fellow YouTuber with John Green, Evelina Barry. We spent most of our time before the event out in the crowd talking to the fans, but we did have time for one pic together. In case you suffer from an affliction similar to Isaac, Evelina is the one on the right. Soon after this pic was taken, it was time for the doors to War Memorial Auditorium to open. The crowd was sooooooo excited, but even so, they were still awesome to each other. 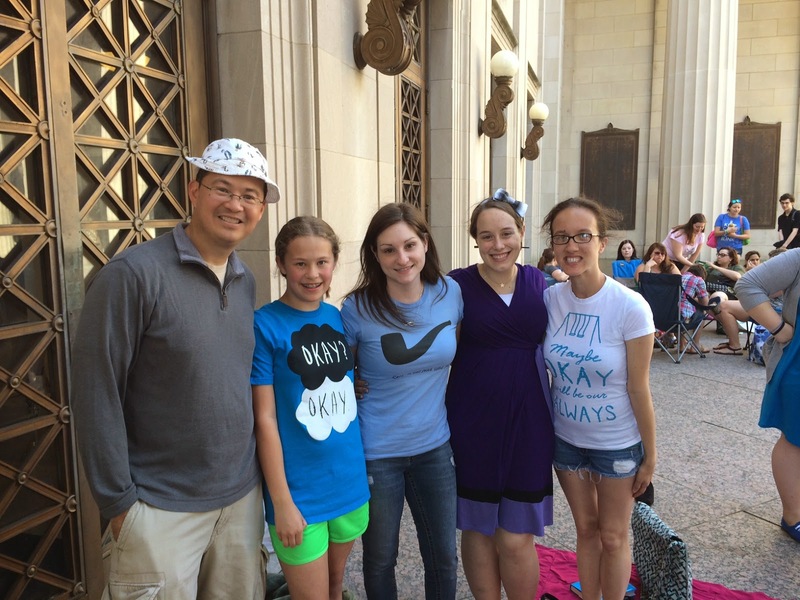 Fault Fanatics waiting for the doors to open...and being awesome. Once the doors opened, 1,900 uber fans were allowed entry into War Memorial Auditorium for the main event. Unfortunately, there wasn't enough room to fit everyone in, but the ones that didn't get in still got a treat by being able to hang out at the red carpet and get autographs from their favorite author and movie stars. 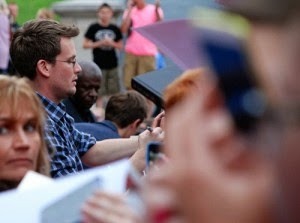 John Green signing autographs on the red carpet. 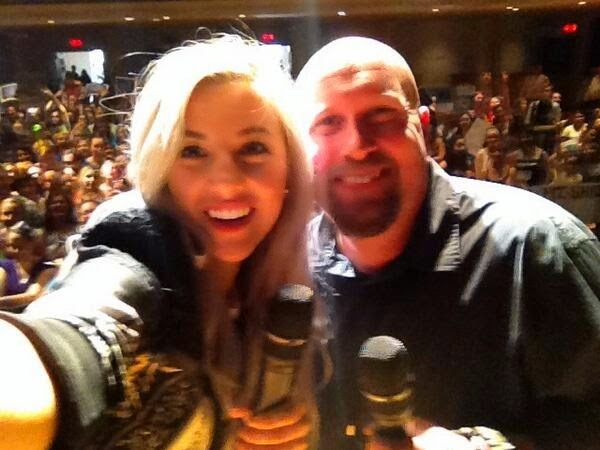 Meanwhile, inside War Memorial, Evelina and I were getting the crowd worked up into a frenzy...and taking selfies. This time Evelina is on the left. 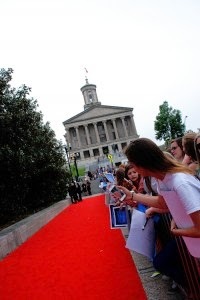 We all know that Nashville is a special place and special things happen here. This night was no different. Because it's Music City, we had to have some live music, and that was provided by TFIOS star Nat Wolff and his brother Alex. I snuck my camera between the backstage curtains for this shot. During their performance Evelina and I were backstage with John, Shailene and Ansel. They had never seen Nat play before and they REALLY wanted to. But, they couldn't just walk out on stage, so they did the next best thing. They laid on the ground and watched under the stage curtain. 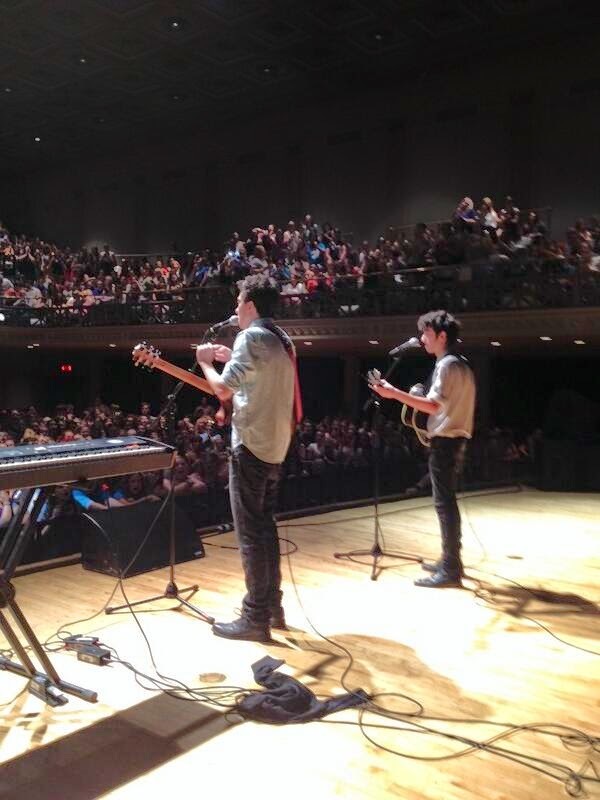 After Nat and Alex Wolff played, the crowd was treated to 10 minutes of the movie not seen before. John Green came out to the stage to thunderous screams, cheers and applause to introduce the sneak peek. He was classy and funny as always. That was a really special moment, even though the crowd only heard about half of it because they spent the other half screaming with joy. They were all so excited to get the exclusive look. Unfortunately, you can't see what they saw, but here is a link to the trailer to give you a little taste of all the feels they had. 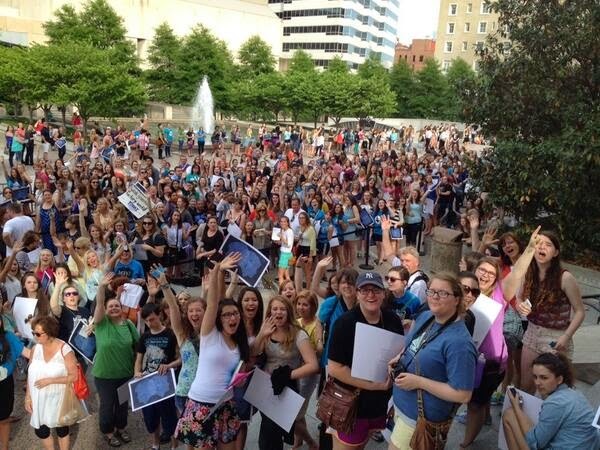 1800 "Marry me, Ansel" (There were about 100 guys there). After the sneak peek, it was time for the stars to make their apperance and do a question and answer session with the audience. Evelina and I took the stage and began to bring out the four stars of the evening. I am not exaggerating when I say that, at the moment I introduced Ansel, it was the loudest sound I have ever heard. It was so loud you almost couldn't hear it. You just felt the pressure on your ears. Once the Q and A got going this happened. Yes, dear reader. This. Happened. Finally, the Q and A session wrapped up and it was time to go. That meant there was only one thing left to do. We did a full crowd "Okay? Okay." It was a beautiful moment. 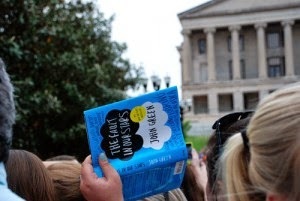 As I left the auditorium that night, I walked to my car parked several blocks away and even 45 minutes after the event had ended I could still hear the screams of hundreds of TFIOS fans echoing through the streets of downtown Nashville. It was truly an epic night. A night that, for many of the fans there, will be one of the best nights of their lives. It was a night that they could count as a perfect little infinity, their own little forever, in their own greater infinity. 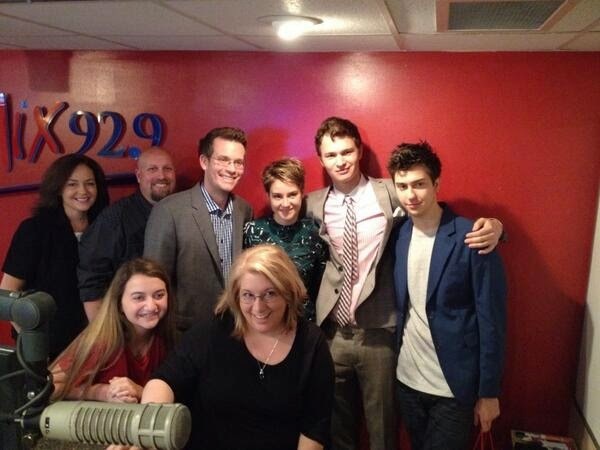 The next morning, John, Shailene, Ansel and Nat were all gracious enough to wake up early and come into Mix 92.9 so we could do an interview with them all. You can hear that whole interview here. It was a blast! They are such a fun bunch. 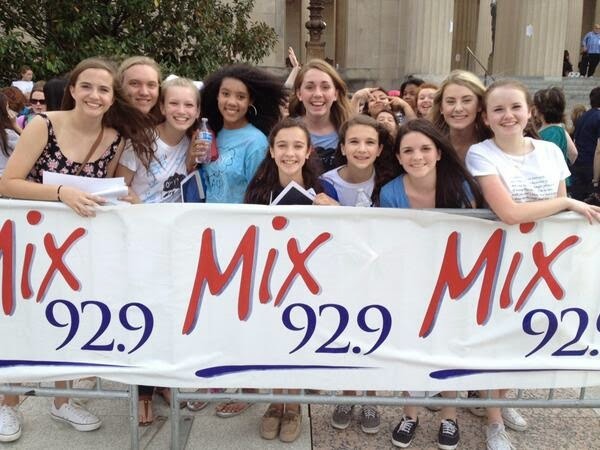 And they even took the time to take a pic with us after the interview even though they had a crazy busy day. All in all it was an incredibly awesome two days with John, Shailene, Ansel and Nat. It was a wonderful little infinity, and I hope someday I will be able to work with them again. This looks amazing Clint. Great job all around. Thank you for the kind words! It was a very exciting evening. Ha, love your GIFs in your post. Thanks! Love the pics in your recap!